Two protestors in last night’s spontaneous protest against the continuous power outage in the Krobo area were shot. 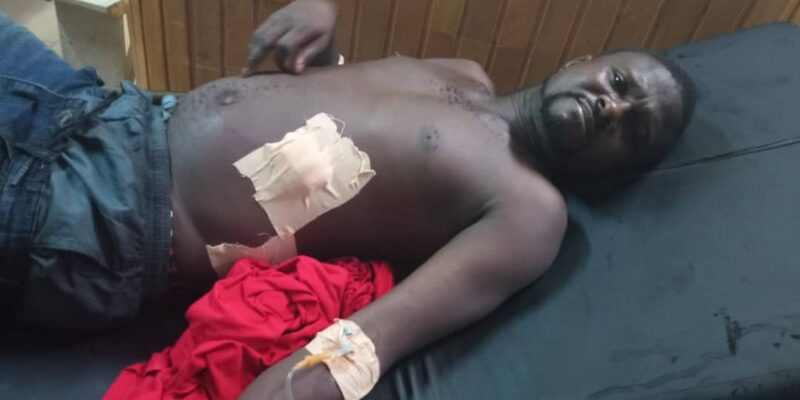 The two; Kwame Asare, 39, and Teye Kwame, 35, were wounded by bullets allegedly discharged at the irate youth after several warning shots failed to disperse the protestors at Somanya Roundabout. The injured persons are currently on admission at the Atua Government Hospital in Akuse. The Protest was started at Nuaso in Odumase Krobo before spreading to other nearby communities including Somanya as the irate youth from Nuaso near Kpong started a riot from Nuaso heading towards Odumase and Somanya to attack the PDS/ECG office. The Somanya District Commander, ASP Isaac Otsin swiftly led a team of Police Personnel to the Somanya roundabout where some of the rioters were met burning about forty car tyres on the Accra Somanya and Odumase main road. Reinforcement team of 85 armed men from the Counter Terrorism Unit drawn from Akosombo division, Akuse and Akropong arrived at the scene. The irate youth who were holding machetes and other offensive weapons, upon seeing the Police started throwing stones at them. The Police, however, advanced on the irate youth and managed to seize 21 lorry tyres. According to the Public Relations Officer of the Eastern Regional Police Command, DSP Ebenezer Tetteh, in the cause of controlling the violence, two Police Constables – Michael Bright Bortey and Edmund Asamoah were hit by stones at the right eye region and the left ear respectively. He said while the Police restrained itself from applying brute force some of the rioters confronted the Police with machetes, carpentry saw, broken bottles and other offensive weapons and the Police realizing that their lives were in immediate danger fired back to disperse the rioters and in the cause, the two protestors were injured. Starr News gathered that despite the injuries recorded some of the protestors remained on the street till 4 am Thursday. A group calling itself Kloma Hengme Youth issued a statement that “following our Press Statement on the power situation a while ago, the Minister of Energy; JOHN PETER AMEWU, through his spokesperson at the Ministry, Nana Kofi Oppong Damoah, has arranged an emergency meeting with the Leadership of Kloma Hengme at the Energy Ministry, tomorrow, Thursday”. The statement added, “as we speak, late in the night at this time, the Minister has also sent his Spokesperson and other experts of the Ministry of Energy to Krobo to access the first-hand situation of the problem ahead of the crucial meeting tomorrow, Thursday”. Police vehicles were torched and properties destroyed in the violent attack. Since the incident, residents have been holding press conferences and sent petitions to the President and VRA on their plan to revolt against payment of electricity bills claiming VRA had an agreement with their ancestors to provide free power for them having dispossessed them of their lands for the construction of the Akosombo Dam. A group calling itself United Krobo Foundation made up of leaders of the various Krobo group is championing the course calling on the VRA to honour its MOU with the Krobo people. According to them, VRA “owes the Krobos in its catchment area free supply of electricity after fifty years of operation on the land”.